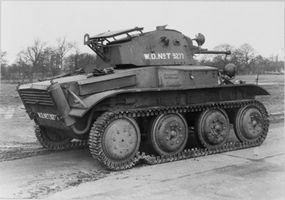 Desarrollado en 1936 por la empresa Vickers-Armstrong, con un total de 177 vehículos con dos modelos básicos Tetrarch Mk I y Tetrarch Mk ICS fabricados desde 1941 hasta 1942. En 1942 veinte vehículos se entregaron a la URSS bajo el Préstamo y Arriendo, de los cuales 19 lucharon en el Frente del Este hasta octubre de 1943. Despite its strong points, the Tetrarch is not without its drawbacks. 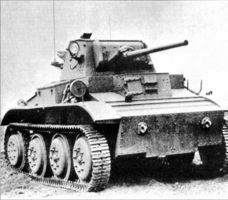 With little to no armor and a small hitpoint pool, an exposed Tetrarch will not survive long against autloaders, machine guns, and anything shooting large HE shells. 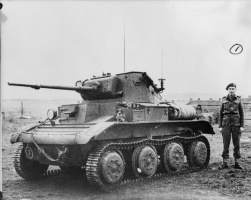 For this reason, the Tetrarch is usually best played at a distance. 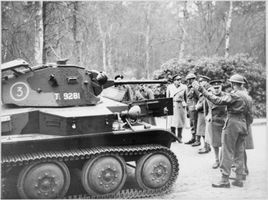 Unfortunately, while the Tetrarch is adept at taking out targets from such a distance, it is usually dependent on its team to spot them. 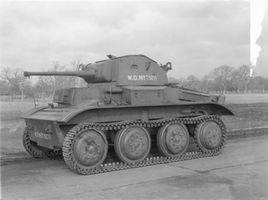 The Tetrarch's poor spotting range often necessitates the use of coated optics or binoculars to see targets at a safe distance. 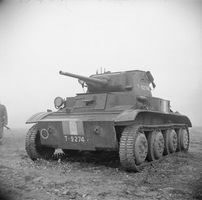 Another thing worth noting is the Tetrarch's low ground clearance, which leaves it prone to bottoming-out on rough terrain and slows it down considerably when this happens. Esta página fue modificada por última vez el 25 oct 2016, a las 10:49.